Software / Re: Update V1.2.5 or V1.3.0 ? changelog.? Announcements / COOD-E KEY Special Forum Sale! Start now until the 21st of February! To show our appreciation to our forum members for their contribution to the forum, we’ve made a special Forum COOD-E KEY! offer that not only gives you the change to be one of the first to get one, but also to buy it for just €25 including shipping instead of €34,95. Order the COOD-E KEY QWERTY at (NO LONGER AVAILABLE OFFER). Since you already owe a COOD-E TV and we want to give you the best price possible, we will ship you a bulk version. Bulk means without retail packaging. This promotion will be available until the 21st of February. We will start supplying all stores next week with the retail version and also a special COOD-E TV including the COOD-E KEY. So in case you have friends and family interested in buying the COOD-E TV, you can tell them the COOD-E TV will be available including COOD-E KEY as of from end next week. 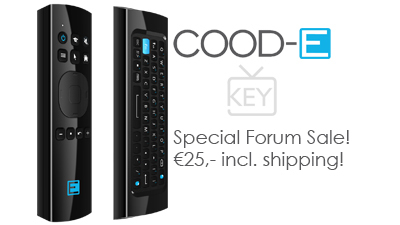 Enjoy your COOD-E TV with your new remote and keep up the good work for the forum! Making a good product and let customers run away with it is more our style. I can assure you that we're very hard working on both topics, and that on very very very short notice I'm able to share some sneak previews on Facebook, Youtube and on our Forum. Software / Re: when will be the next update? We're working on the new firmware, at the moment 15.2 is being tested in Alpha Firmware. We use now a modified Kodi 14.x. Cood-E TV needs to be stable, and is not a “hobby box” so once a new version is stable in a BETA Firmware, we consider to implement it in the final firmware. Since the Cood-E TV has auto update, you will be informed automatically if your box is connected to the internet when available. Yep, that's the problem, the GUI of android apps are mainly built for touch interface, you can connect a mouse for the time being, later we'll have the COOD-E KEY with integrated air mouse which solves that problem as well. With this work around you can put almost every app from the Google Play store on the device. Please note that some apps will not work with the standard remote because they're made for a touch interface. We faced some unexpected challenges with the COOD-E KEY , but it seems everything is ok and we can start production on short notice. We keep you informed, as soon as we have an exact date that it will be instore. +1 for sharing this with the COOD-E community, we tested the skin as well and it works, you can install / update android apps from the google play store. As we all know a lot of our users want to update the KODI version of the COOD-E TV, so maybe some users (like us) will immediately try to update the KODI software…. So enjoy this work around to get all Android apps, but do not update the KODI software!